Chabad of Cole Valley does not have official “membership”. This allows us to always welcome every Jew with open arms, regardless of background, affiliation or financial means. This is a core value of Chabad of Cole Valley. As a result, we depend solely on the goodwill and generosity of the local community to cover our year-round expenses. And if you're commited to see Jewish identity prosper in Cole Valley and beyond; If you're ready to invest in our quality programs benefiting the entire community — then we hope you'll consider joining the "Shareholder Circle". 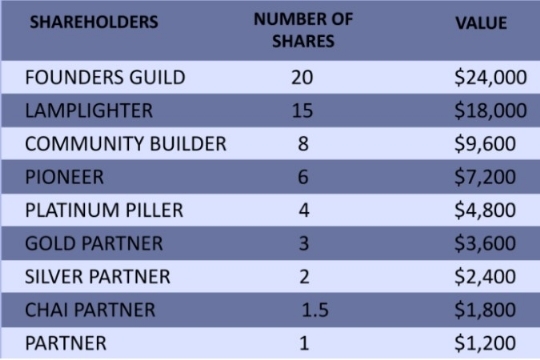 A “Shareholder” is, essentially, a partner. It’s modeled after the age-old Jewish tradition, according to which the Heavenly reward for good deeds is divided equally between those who perform it, and those who make it possible. Partnership in Chabad means that you are a partner in supporting a given percentage of our financial needs It also represents a commitment to the community – It means that you are involved in keeping yiddishkeit alive and seeing it continue to the next generation. Our Fundraising Goal for fiscal year 2018 is $151,200. Please see chart below of how we hope to accomplish this. Click here for a list of supporters from last year. If you would like to become a Shareholder, please fill out the secure form below. If you have any questions please contact Rabbi Nosson Potash directly on 415.598.8718 or rabbi@chabadcv.org. Mr. Mrs. Ms. Dr. Rabbi Mr. & Mrs. Mr. & Dr. Dr. & Mrs. Rabbi & Mrs. YES! I/We appreciate the opportunity to become a "Chabad CV Shareholder"